The music lover will have daily reasons to attend the Kenosha County Fair. A variety of acts coming to the Creekside Stage should mean most everyone finds something they can tap their foot — or bob their head — to. The Toys — Thursday, Aug. 18, 8 p.m. to midnight. Their My Space pages list the following as influences: 3 Doors Down, Alabama, All American Rejects, Big and Rich, The Charlie Daniels Band, Collective Soul, Daughtry, Dierks Bentley, Electric Light Orchestra, Erasure, Fall Out Boy, Finger 11, Good Charlotte, Green Day, Jason Aldean, Jimmy Eat World, Joe Walsh, John Denver, Journey, The Killers, Maroon 5, Matchbox 20, The Outfield, Pink Floyd, Queen, Rascal Flatts, Red Jumpsuit Apparatus, Rednex, Rodney Atkins, Seether, and Weezer. Rebel Grace will appear on Friday, Aug. 19, 8 p.m. to midnight. Their website describes the band as the “Midwest’s newest Country Band blending Original Music with all of your Favorite Country hits. 4 Lane Highway will appear Saturday, Aug. 20, 8 p.m. to midnight. The band features “rockin’ country” according to its website. Class of ’62 will play on Sunday, Aug. 22, from 2 to 4 p.m. This five-piece band bills itself as a Buddy Holly tribute band and is becoming a fixture of the last night of the Fair. There also is plenty of music, in a variety of genres, at the talent show, on Thursday, starting at 6 p.m. at the Free Acts Stage near the Fair office. For many a youngster, the culmination of a year’s effort will be at the small and large animal auctions at the Kenosha County Fair. The Large Animal Sale starts at 1 p.m., Saturday, Aug. 20. The Small Animal Sale takes place on Sunday, Aug. 21, starting at 1:30 p.m. If you’re going to the Kenosha County Fair, sometime you’re going to have to eat. Lucky for you it’s hard to imagine another place where you can find such a variety of food, most of it decadently delicious, if perhaps not what your physician would like to see you consume on a regular basis. As I have mentioned before, I have spent a fair amount of time at the Fair through the years. Consequently, I’ve eaten many a fFair food meal. For my money, the best deals are available at the stands of the service clubs and other local organizations that serve food at the Fair as fundraisers for their good works. Some examples are Westosha Kiwanis, Kenosha County 4-H, Lions Club, Knights of Columbus, and the Farm Bureau. At these places, you’ll find food that is varied, delicious and well-priced. Better save some room for a fried meal and a sweet treat. 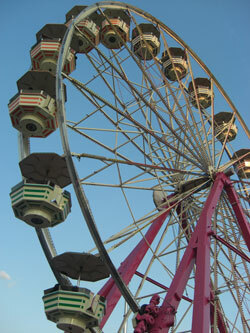 This year’s fair runs from Aug. 17-21. If bidding on beef, swine and poultry is not your thing, you still have other options at the Kenosha County Fair. The annual pie auction takes place starting at 8 p.m., Saturday, Aug. 20, in the auction building. Judging for Kenosha County Fair Fairest of the Fair got under way tonight. Keisha Berry, 19, of Trevor. Hannah Esch, 18, of Paris. Lauren Vanderwerff, 20, of Salem. Courtney Panek, 19, of Kenosha. Renee Haney, 19, of Brighton. Heather Edmonds, 20, of Randall. 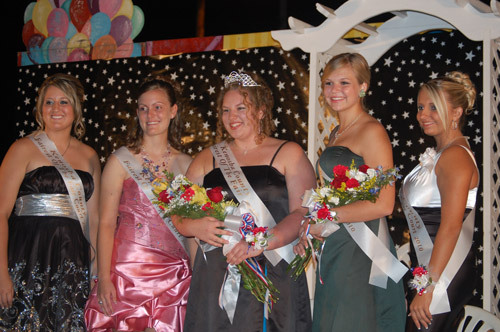 This year’s Fairest of the Fair will be crowned at one of the first big events of the Fair on Wednesday, Aug. 17, at 9 p.m. The Fairest and her court members will then preside over numerous events for the rest of the Fair. The Kenosha County Fair runs this year from Aug. 17 through Aug. 21. Some things only happen once a year at the Kenosha County Fair, which this year runs from Aug. 17-21. But some of the entertainment happens every day, throughout the day. Part of this daily entertainment line-up is Nick’s Kid Show, which has become a regular at the Fair in recent years. Nick’s Kid Show features musical fun and entertainment for kids. Audience participation is big in Nick’s Show, which also is high energy with plenty of humor. Hawk Hallow Chain Saw Carver. Chances are sometime on TV or in person you’ve seen the spectacle of organized cars smashing together known as demolition derby. But, put the Fair in an area where there’s still some agriculture going on, like Kenosha County, and unique events like combine demolition derby spring up. Combine demolition derby takes the huge machines that farmers use to harvest corn, grains and soybeans and pits them against each other in the metal bending world of demolition derby. The results are one of a kind. The last combine in running order wins. The Kenosha County Fair, which runs from Aug. 17 to 21 this year, has two nights of combine demolition derby — Wednesday and Thursday evening, as part of the truck and tractor pull program starting at 6:30 p.m. There’s no extra admission for the combine demo derby, which takes place in the Grandstand Area of the Wilmot Raceway right on the Fairgrounds. You don’t have to be a sprint or stock car driver to go racing at the Kenosha County Fair, Aug. 17-21. Robinson’s Racing Pigs, pigs that race — and swim — just for the reward of an Oreo cookie, have become a fixture at the fair, which takes place at the fairgrounds in Wilmot. Florida-based Robinson’s has several units that travel the country with speeding swine. One will be stopping and performing daily at the Kenosha County Fair throughout each day of the fair. Some of the little porkers run around an oval track. Others run and then plunge into a pool and swim to make the finish line. All are just trying to be the first to get the Oreo — their preferred cookie choice — that lies at the finish line. Fairgoers with talent can display their skills at the Kenosha County Fair. The fair will host a talent show at the Free Acts Stage — one night only — on Thursday, Aug. 18, starting at 6 p.m. This is a change from previous years in which two shows were held. If you’re the kind of person who likes to throw some weight around, the Kenosha County Fair has an event just for you. The hay bale throwing contest will take place at 6:30 p.m., Friday of the fair. Pre-registration starts at 6 p.m. There is a $1 entry fee. The premise is simple. Take a bale of hay and see how far you can toss it. Techniques vary. Youngsters will be putting pedals to the metal on Thursday and Friday at the Kenosha County Fair as part of the annual Pedal Tractor Pulls. The competition is sponsored by Jockey International and is open to youngsters from 5 to 12 years old. In pedal tractor pull, the kids pedal a special pedal-powered tractor pulling a sled that is a mini-version of the type used in engine-powered pulling competitions. The farther the competitor pedals, the heavier and harder to pull the sled becomes. The person that pulls the farthest with the most weight wins. The competition is divided up into four classes: 5 to 6 year olds, 7 to 8 year olds, 9 to 10 year olds and 11 to 12 year olds. Prizes are awarded for the top finishers. Competitors can register between 10 and 11 a.m. Thursday and Friday of fair week at the 4-H exhibit buildings. The pull takes place nearby starting at 11 a.m. on Thursday and 11:30 a.m. on Friday. This year’s fair runs from Aug. 17 through Aug. 21. If you’re looking for a place to get inspired about the school children you might check out the School Exhibits Building at the Kenosha County Fair. The building is literally decorated wall-to-wall, floor-to-ceiling with school work of Kenosha County students. Some are art, some are more explanatory, all are visually interesting. Public and parochial elementary schools from anywhere in the county are eligible. Students earn ribbons and premiums for their projects displayed in the building. The school exhibits building is located just west of the Westosha Kiwanis food building and north of the Midway on the main east-west fairgrounds road. The Kenosha County Fair runs Aug. 17-21 this year at the fairgrounds in Wilmot. 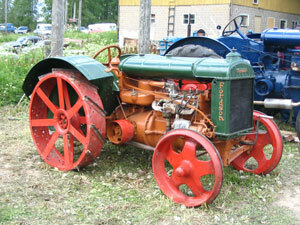 For 44 years there has been an antique farm machinery exhibit at the Kenosha County Fair. That’s a long time. But much of the equipment in this display will be considerably older. There’s not a lot of time left, but still some, for individuals interested in competing to be named Fairest of the Fair for this year’s Kenosha County Fair to submit their application.